The Rebecca Sieff Hospital, at the bottom of Safed, just off the by-pass road, is also known as Ziv Hospital, and treats patients from the Upper Galilee and the northern Golan. It is a government public general hospital with 310 beds and serves as a Regional Trauma Center in case of accidents, natural disaster, terror attacks and war. 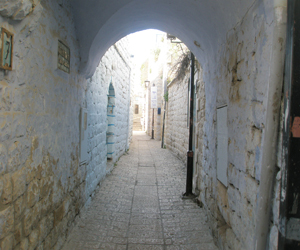 Apart from the residents of Safed, the hospital serves the local Jewish kibbutzim, moshavim and small towns as well as the Arab and Druze villages in its catchment area. The hospital personnel reflect the population it serves, and whether you speak Hebrew, Arabic, Russian, Amharic or English there is bound to be a member of staff or even a visitor who can help you communicate your problem. The maternity ward and the pediatrics unit are two of the most important departments, as the hospital serves several groups that tend to have a lot of children; very observant Jews and traditional Arabs. In fact, in 2007, there were 2,900 births, an average of 8 births a day, and there were some 3,000 patients admitted to the Pediatrics unit. The neonatal ICU and the Child Development Center also offer health care provision for babies and children together with a team of medical clowns, who help the young patients overcome their fears as well as help them to heal through laughter. The hospital has a School of Nursing as well as a specialist oncology unit, and Ziv's cardiac department is known for its excellence. There are several Out-Patient clinics on-site as well as a mental health unit, housed off-site, with both out-patient provisions and in-patient care. The Accident and Emergency Department had over 60,000 patients admitted during 2007 and its Trauma Unit was vital in the 2006 conflict. During the 2006 Lebanese war, the hospital was used for emergency services for the soldiers fighting in the Lebanon. One katuysha rocket had a direct hit on the hospital which caused damage to the infrastructure, as well as injuring five patients, 2 doctors and two other members of staff. Over 1500 casualties were treated during the conflict, with 288 IDF soldiers and 125 civilians needing hospitalization. As with most hospitals, there are a lot of volunteers who offer services. One important service is the Yad Sarah office in the basement which provides wheelchairs, walking sticks and other medical supplies on loan to patients, who don't wish to or can't afford to buy their own. There are also a group of dedicated volunteers who provide supplies for Shabbat observant patients, as well as mehadrin kosher food during the week. Ziv hospital has many plans to improve its health care provision, including a new Child Health Center. The new Center will offer pediatric care in one protected and secure facility and add a much needed underground shelter able to hold up to 100 people in a case of emergency. The government has also decided that Israel's new Medical School in the north should be built in Safed and this will help improve the health care offered to the local population.